Some of my best memories of childhood are playing games with my neighborhood friends. Visions of building forts, playing kickball and making up our own games was so much fun. I have my own three young children now and even though they do lots of outdoor play, I realized that they haven’t yet had the thrill of their first outdoor imaginative game. 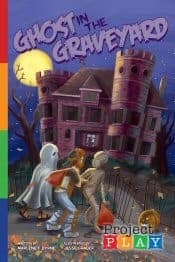 This all changed when we received a copy of Ghost in the Graveyard, Marlene Byrne’s fifth installment in the lively Project Play Children’s book series to review. The kids and I immediately settled in to read the latest edition in the Project Play book series. My young children sat captivated as I read about Sam and his friends pook-tacular adventures on Halloween night. My children immediately wanted to start playing and it was so easy to explain how to play as the rules are included in the book. My husband and I and even the family dog joined the kids in our own version of Ghost in the Graveyard. I have to admit it was a blast and the kids have asked to play again and again. Having so much fun playing Ghost in the Graveyard inspired me to check out more at the Project Play Website. I found several more books in the series that caught my attention, including âTreasure Hunt, Kick the Can and Follow the Leader. I will definitely add these to my shopping list as any of the books in this series would make a creative and unique gift to have on hand for that special child. I really enjoyed how the website is so easy to navigate for both parents and kids. It even has a section where you can get inspired for some new games and read the game rules. I wasn’t sure if my children would be too young to play this game, but I have no doubt that these books are inspiring for kids of all ages. If you are looking for creative and fun outdoor games to inspire your children then check out Ghost in the Graveyard or any one of the other 4 titles at Project Play. This post was written for Family Review Network & Project Play who provided the complimentary product in exchange for my honest review. Aww…this sounds like a cute read! I love that it’s interactive…may be something for teachers and parents to incorporate into their reading schedules…especially during the Halloween festivities coming up soon. Thanks for sharing!